The world united in outrage in April 2014 when news broke that nearly 300 girls had been snatched in the night from their school in northeastern Nigeria by the terror group, Boko Haram. In the ensuing pandemonium, vast national and global outpourings of grief and solidarity were punctuated by claims that the kidnapping was a scam and false reports of a military rescue. Amid this activity, former minister Obiageli Ezekwesili took on the role of champion for the cause and co-formed the Bring Back Our Girls movement (BBOG) demanding the safe and swift return of all the girls. BBOG launched from a hashtag into a digital activism hurricane whose highlights would come to include messages by Michelle Obama and pledges of military support by the U.S., Israel and Great Britain, among others. Today, 16 months after the kidnappings and a few days short of their 500th-day anniversary on August 27th, the girls are still not back (219 remain in captivity and sexual slavery after 57 escaped) and the clamor for their return has waned considerably—one writer describes it, rather harshly, as being in the junkyard of digital activism. Yet the movement treads on, determined by all indications to achieve its cause. BBOG is attracting renewed attention not so much for what it’s doing but for its supposedly unaltruistic motives. News of separate political appointments of BBOG co-leader Hadiza Bala Usman in April and June of 2015 drew fresh allegations that the movement is a covert campaign for political office of its leaders. Others claim that BBOG has plateaued because it lost its raison d’être when former president Goodluck Jonathan lost power to Muhammadu Buhari in the May 2015 elections. Undeterred, the movement’s leaders and members sought and secured an appointment with President Buhari on July 7th, where they presented him and the newly appointed service chiefs with a list of demands regarding their cause célèbre. BBOG’s Lagos chapter met with state senator Oluremi Tinubu on August 18th, and the larger body is planning activities to mark the 500th day since the kidnappings. Some of the movement’s representatives reportedly held a private meeting with UN Secretary-General Ban Ki-Moon during his recent visit to Nigeria. This seems to be an opportune time to (re)assess the movement’s achievements thus far, taking inventory of the challenges it still faces and what opportunities there are to sustain and deepen its impact going forward. Social movements, like all political events, do not occur in vacuums. In the context of Nigeria’s political history, BBOG is easily among the most enduring social movements, especially those led mainly by women. The movement’s resilience demonstrates the power of informed citizen action, the consolidation of the country’s democracy, and the ability of different cultural, social and religious groups to mobilize and stand together through difficult circumstances to achieve a common goal. 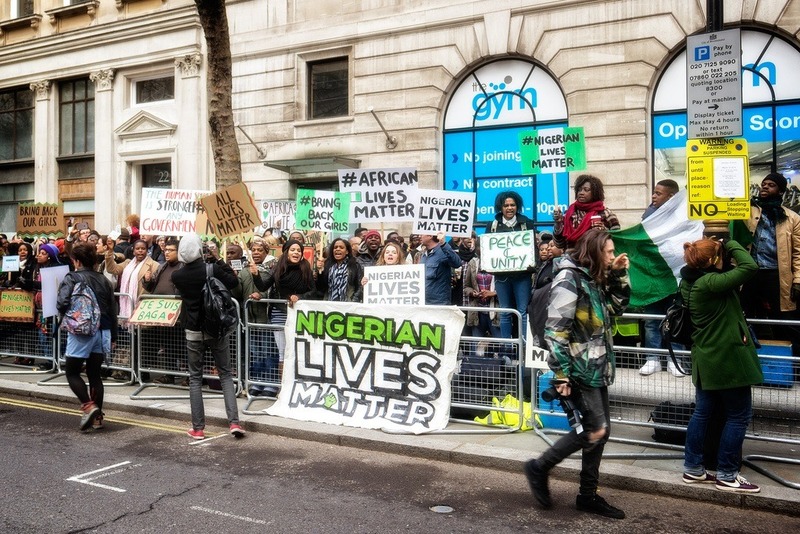 The group’s sustained campaign has provided repeated cause and pause for reflection—national and international—on the Boko Haram crisis, the government’s response to it, and what it all means for security in Nigeria, especially for women. BBOG endured a veritable minefield to get this far. From Jonathan’s outright denial that the kidnappings occurred and initial attempts to prevent protests through the nonchalance, secrecy, and inconsistency with which his administration handled the matter until he left office, only sheer stoicism could have led the movement to insist and persist this long. It remains unclear what strategy the federal and state governments are pursuing despite assurances to do their best to rescue the Chibok girls. Buhari’s assertion that he can make no promises is not reassuring. It must be difficult for BBOG to know whether it is working with or against political and security leaders’ efforts. The skepticism that confronts BBOG seems to be borne less by reality than damaging perception. The movement’s purported slowdown is the result of reduced public interest on social networks and not within BBOG itself, which has maintained a steady momentum from the onset. The group is not the first to get caught up in a short-lived social media storm that very quickly fixates on the next online sensation. The group’s membership includes civil society heavyweights like Usman and what looks to be a core of unwavering faithfuls. However, BBOG does not seem to have the same broad traction within Nigeria as did Occupy Nigeria, for instance, which could be a factor for reduced political agency and power to effect change. The Chibok saga is rightly viewed as an attack on all women. Yet, as news emerges of the release of other mainly female Boko Haram hostages, it may be hard to continue to justify BBOG’s singular focus on the schoolgirls. One clear priority for BBOG’s leaders would be to forestall further attacks on its credibility by not easing pressure on Buhari’s government if it does not respond concretely to their demands. A second would be for the movement to self-evaluate in order to determine what has worked or not and to map those opportunities that may be afforded by the recent change of government. A third and final key action would be to document rigorously the movement’s experiences—as evidence and inspiration, but also as learning for itself and for future social movements. If it’s true that race-based stress is at least in part to blame for high infant mortality rates, there remains a larger agenda to pursue.